I did a bit of research online, and found a few old postcards of the Cochato Club, the place where my Iris painting was exhibited in 1931. The club was named after a river. It was located on Elm Street in Braintree, Massachusetts. The building is now an Elks Lodge. 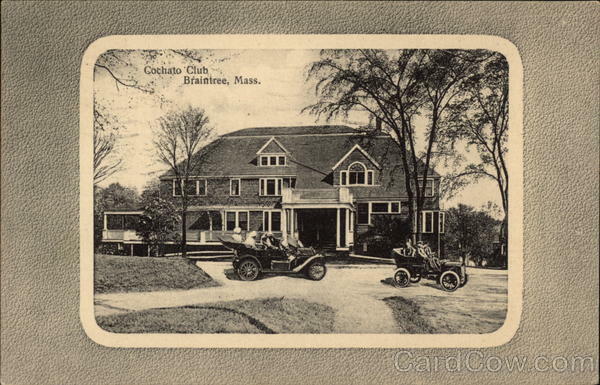 Their site claims the “foundation is dated 1789,but [the] building was rebuilt in the 1860’s after a fire, [and the] bowling lanes in [the] basement were used as early as 1905.” It’s interesting to think that my ancestors were members there, and that the building still stands. My painting hung there between April 11th and 18th, 1931, before my maternal grandmother, the relative I inherited this painting from, was even born. Wild. The initials of the painter are “M.C.L”, and it’s dated 1910. I still don’t know who painted it, but I’m working on it. My great-grandmother’s maiden name was Catherine Leonard, so I imagine the painter is from her branch of the family. What the “M” stands for, I don’t yet know.